Our puppies have all been placed in their new homes. Pictures will be posted as soon as we get them. The Long Island KC held their match on Jan. 25th and our kids did well. "Junior", Paxon's Ghost Dancer won his class & behaved very well for a 5 month old baby. Paxon's Rumor Has It, "Rumor" was awarded Best Puppy & went on to win the Puppy Terrier Group!! Paxon's Darragh, "Dora", was shown in the Bred By Exhibitor class & went all the way to win the Bred by Exhibitor Terrier Group!!! 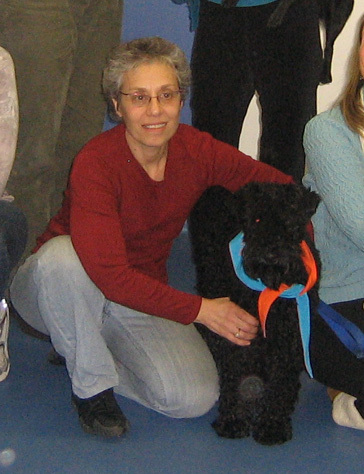 "Moxie" passes her training course & her tests to become a Certified Therapy Dog, making her owner Barbara very proud!!! "Moxie" congratulates her brother "Rumor", Paxon's Rumor Has It for his win at the Rockland Co. KC show, Feb. 24th. He was awarded WD, BOS from the 9-12 puppy class!!! Paxon's Darragh, "Dora", was awarded RWB. At the Kennel Club of Northern New Jersey, March 2nd., "Rumor" is awarded WD, BOS, from the 9-12 puppy class!! The following week, at the Saw Mill River KC, "Rumor" gets the nod & is WD,BOS!! 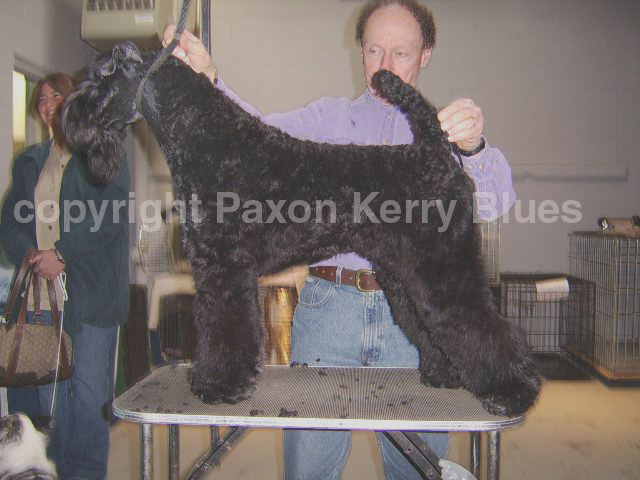 Paxon's Ode to Dingle Bay, "Patrick", owned & handled by Bob & Emmie Jones is awarded WD at the Lancaster KC, March 14th. On March 21st, at the New Brunswick KC, "Rumor" is awarded WD, BOS & Best Puppy, from the 9-12 month puppy class!! "Junior", Paxon's Ghost Dancer, is awarded RWD from the 6-9 month puppy class!!! The following day, at New Brunswick KC (2) "Rumor" is once again WD, BOS!!! "Junior" is following in the footsteps of his parents ( the late Ch. Paxon's Dancer's Image (1981-1994) X Ch. Paxon's There's No Question ) by winning his 1st points from the puppy class!!! "Junior" was awarded BEST of BREED at the Sand and Sea KC on March 30th at the tender age of 7 months!! Thank you Lois Grier, Krisma Images, for such a beautiful job!!! On April 27th, at the Long Island Coalition of Dog Fanciers fun match, our 2 young puppies did VERY well!!! 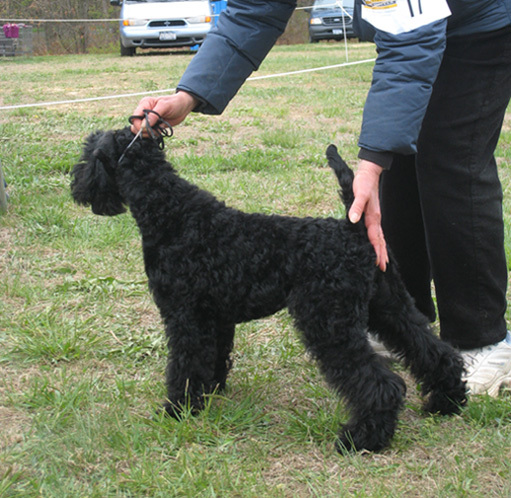 "Buddy", owned by Doug dos Santos placed 2nd in the 3-6 month class (his 1st time at a dog show). 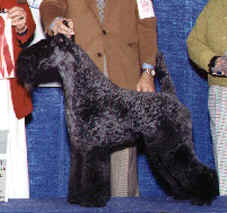 "Cosmo", owned by Allen Shaener, was Best Kerry puppy, then was awarded Puppy Terrier Group 1 !!! The Empire KBTC hosted the USKBTC Traveling Specialty the weekend of May 17th. "Cosmo", Paxon's Cosmopolitan Vinter's Reserve won his 6-9 puppy class & later was awarded Best Puppy & went on to win a Puppy Group 2!!! At the Long Island KC, Sun. May 18th, EmpireKBTC Supported entry, "Nuala", Paxon's Celtic Woman at Kilkee is awarded WB, BW for a major win!!!! On May 24th & 25th, at the Monmouth & Plainfield KC shows, Paxon's Rumor Has It, "Rumor", is given the nod for WD both days! June 28th....Happiness is being invited to the SUBWAY SERIES, AND watching your team WIN!!!! Finding your grandkids at the same game, a few rows away...PRICELESS !!!!!!!!! The AKC makes it official !!!! new CH. 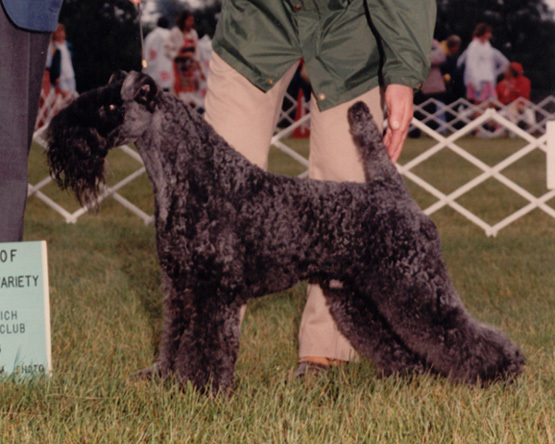 Paxon's Rumor Has It, "Rumor", is the 29th champion for his sire, Ch. KitEhawk's Black Tie Affair , is the 80th KERRY champion for PAXON, AND the 100th Champion for PAXON over all!!!! "Rumor" finished with 3 straight major wins including a Best of Breed!!!! 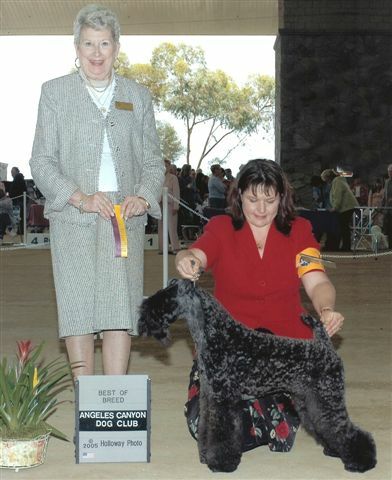 July 2, 2008, Paxon's Cosmopolitan Vintner's Reserve, "Cosmo", is awarded WD, from the puppy class for a MAJOR win. He repeats the win on July 5th!!!! (over a special) for a MAJOR win!!!! 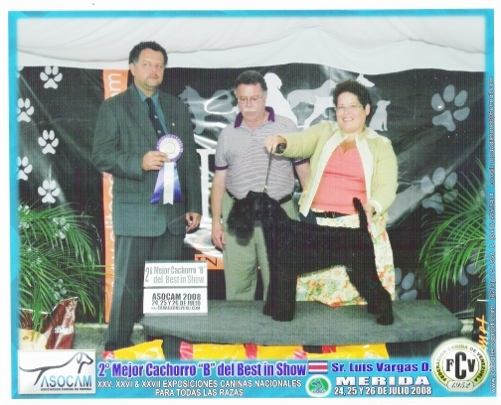 "On July 24, "Dancer" made her debut winning the BIS at the puppy class "B"(6-9 months) at the Asociacion Canina de Merida,Venezuela.The Judge was Mrs Felicitas Mattosch from The Republica of Paraguay. 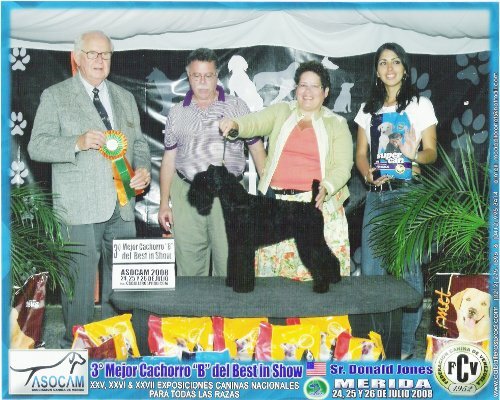 On July 25,"Dancer" was 3er Bis at the puppy class"B"(6-9),at the Asociacion Canina de Merida,Venezuela.Rhe judge was Mr.Donald Jones from USA. On July 26,"Dancer" was 2Bis at the puppy class "B"(6-9 months),at the Asociacion Canina de Merida,Venezuela.The Judge was Mr.Luis Vargas from Costa Rica." Congratulations to the Alfonzos' on her success!!! "Moxie", Paxon's She's Got Style, makes news at the library. Click HERE to read all about her interview!!! Paxon's Cosmopolitan Vintner's Reserve,"Cosmo", is awarded WD at the Newton KC shows & Sussex Co. KC show the last weekend in Aug.
On Sept. 28th, New Ch. Paxon's Celtic Woman at Kilkee, "Nuala", finishes in style, winning 3, 4 point majors at supported entries. "Nuala" is proudly owned by Judy & Peter Lamken. At the Empire KBTC Specialty, Sept, 27th, Paxon's Secret Affair, "Secret", steps into the ring for the 1st time & wins puppy Sweepstakes!! On Sept 28th, at Empire Supported entry, Paxon's Cosmopolitan Vintner's Reserve, "Cosmo", is given the nod for WD,BOS! Cristina & Michael welcome new family member "Cleo"
At the Ramapo, Palisades & Monticello shows, held on the Columbus Day weekend, "Cosmo" , Paxon's Cosmopolitan Vintner's Reserve, won 2 Best of Breeds, & 3 BW. "Buddy", Paxon's Hanlon, was WD,BOS on Columbus Day & Paxon's Secret Affair, "Secret", was WB.BW,BOB!!!!! 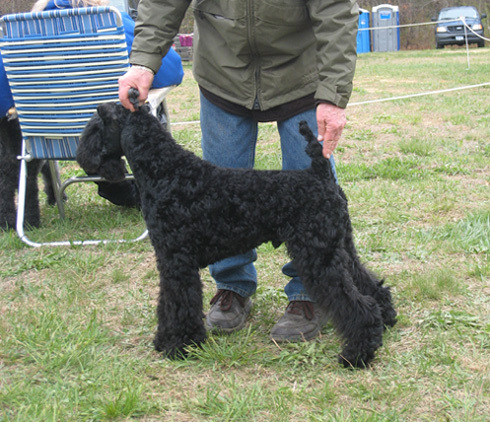 "Cosmo" becomes our 102nd champion, finishing at the South Jersey KC with a Best of Breed!!! !